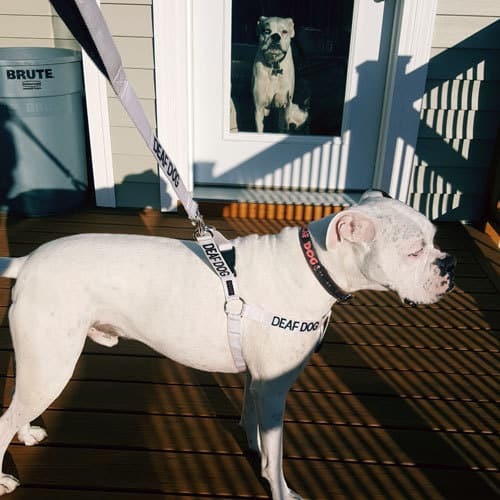 Meet adoptable deaf dog Leo who is a sweet 7 year old deaf dog who is looking for a forever home with someone who will cherish him, become his best friend and always keep him safe. From his foster: Leo is a lovable 7 year old deaf Pit who is searching for his forever home. I took Leo in a few weeks ago to foster him, trying to give him a second chance at life. Not much is really known about Leo’s past, but he’s a good boy and such a love bug. I was told Leo is good with other animal’s and kid’s. He enjoys running in the yard and playing fetch. He’d make a great addition to your family.